#27 in 2012, still looks the same. It is important to clean traps out at the end of each season if you want them to last. There may be wax moths and larvae in there. I remove those and feed em’ to the chickens. Earwigs, ants, and spiders of several different species will set up shop also. Some of these inhabitants make a real mess inside. The unwelcome insects and all their junk should be dumped out after removing the frames. 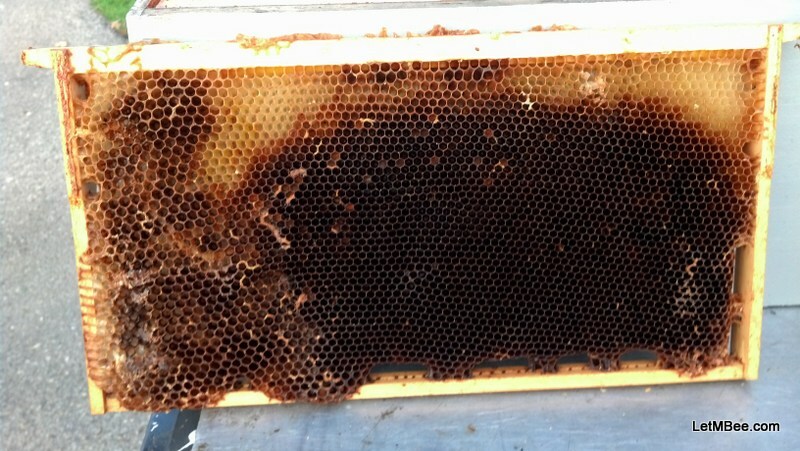 Once debugged the EMPTY frames can be put back inside the trap, along with the lid-screws and Lemon Grass Oil baggies. 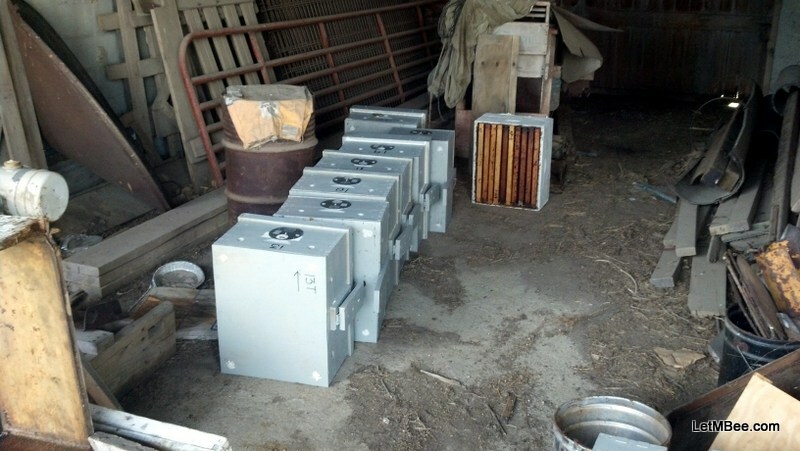 The lids are set on top and the traps are stacked out of the way until next Spring. Stack the ones that need work in a separate location from the ones ready for next Spring. Foundationless Deep Frame from 2011. 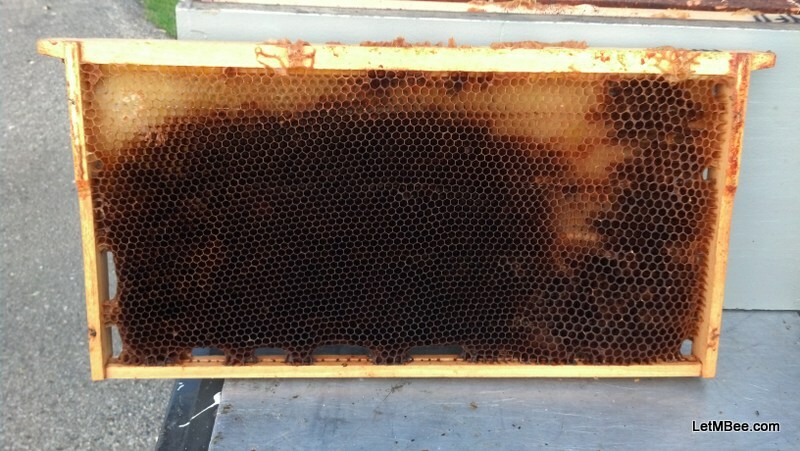 The frames of bait comb need to be removed and inspected. They should be either melted down or frozen. Normally I use the best bait combs early in the season and catch swarms with with them. Most of these combs were second string and are marginal at best. Usually by this time of year remaining bait frames are melted. 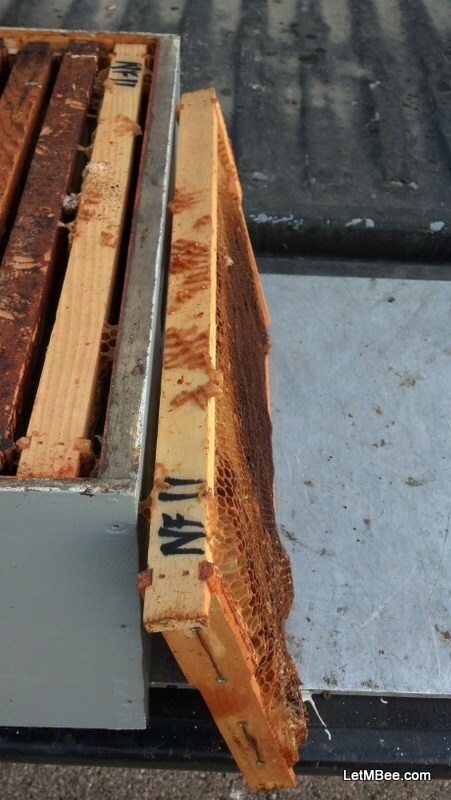 Typically they are brood frames with too much old pollen packed in them. It has been my observation that combs overly packed with pollen are less attractive to swarms. If they feel heavy they don’t catch. Next Spring as I am preparing to load traps I will go through bait comb selection more closely as I need to be paying better attention to it. I can’t do it now because those bait combs haven’t been vacated yet. I am already trying to predict winter losses and am counting on them to provide bait combs for next year. Traps in line to be cleaned. This is a good time to take note of repairs that need to be made on your equipment. Keeping on top of maintenance will make things last a long time. Nothing is more frustrating than working on traps while you should be hanging them. When you get home from work this fall spend a couple hours getting your equipment built and/or maintained. It gets dark earlier so you can work in the garage with the lights on a couple evenings……. Just an idea. Listen to some podcasts and learn something. What are you going to do right after you read this? If you have 20 minutes you should get started on some traps for next year! Here are a couple more shots of that frame melter frame. This side is nice but the other side is ugly. MELT IT. This side is not very straight and has wax moth damage. 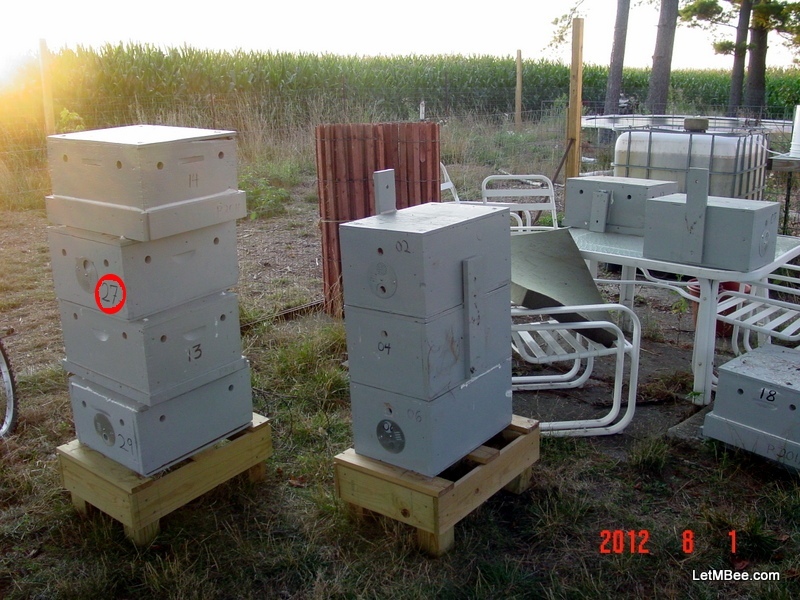 This entry was posted in HowTo, Posts, Swarm Trapping, What's going on.. and tagged bait hive, beekeeping, feral bees, Indiana Beekeeping, Jason Bruns, swarm trap, swarm trapping. Bookmark the permalink.